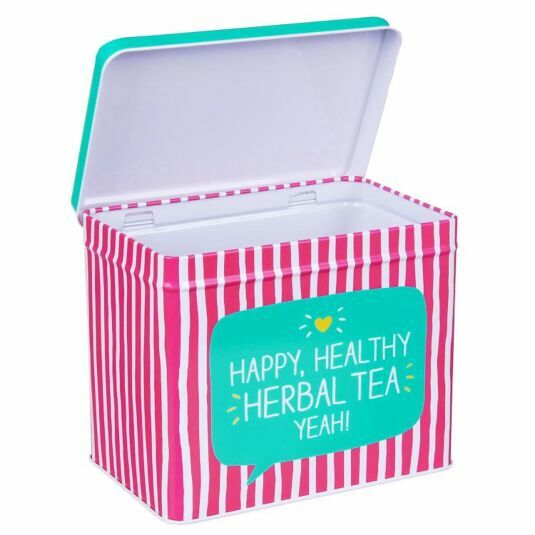 At this time of the year, we all cringe at the thought of getting healthier and fitter through meal planning and drinking right, but Happy Jackson is here to make us smile in the mission ahead with this positive talking Herbal Tea Rectangular Caddy! Whether your tipple is lemon tea, ginger, green or oolong, all varieties of tea bags will be welcome in this perfectly fitting tin. Large enough to hold a good range of your favourite teas, but also small enough to keep in a cupboard, this caddy features a hinged lid for easy use! Vibrantly coloured in a combination of pink, green and white, the base of the tin is decorated in a striped pattern of pink with white stripes whilst the lid is coated in a soothing pale green. 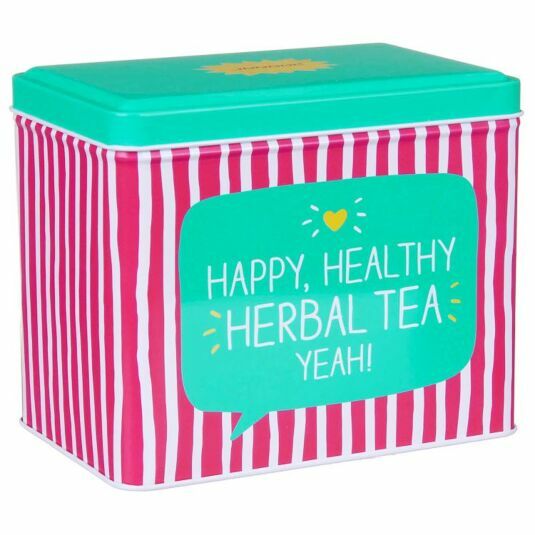 The lid itself is adorned with the text ‘mmmmm!’, whilst the main text is featured on the front of the caddy which reads ‘HAPPY HEALTHY HERBAL TEA, YEAH!’ in a bold white font, surrounded by yellow glow marks and finished with a yellow love heart. Kickstart your healthy tea-drinking habit with this ultra-vibrant and modern tea caddy from Happy Jackson, the perfect and fitting addition to anyone kitchen, making the ideal gift for new homeowners or university students alike!